PokerStars was founded in 2001 by Isai Scheinberg, an Israeli/Canadian senior programmer at IBM. The company grew into a behemoth poker empire under the private ownership of the Scheinberg family until it was acquired by Amnaya Gaming in 2014 for $4.9 billion. 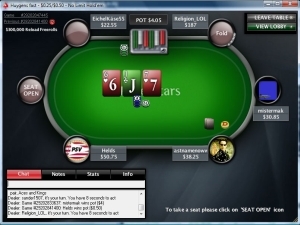 PokerStars is currently the largest online Poker room in the universe. What does that mean? It means they have (50,000+) more players logged into their site than all their top competitors combined. Every type of game from micro stakes of 5c to $100 - $200 limit games are available in abundance. You can click on a table to watch a real money game in progress. You can play on the free practice beginner tables no deposit required. Or if you already know how to play poker, fund your bankroll and jump right into the action. Download PokerStars and join the thousands of live players who are playing right now for free. 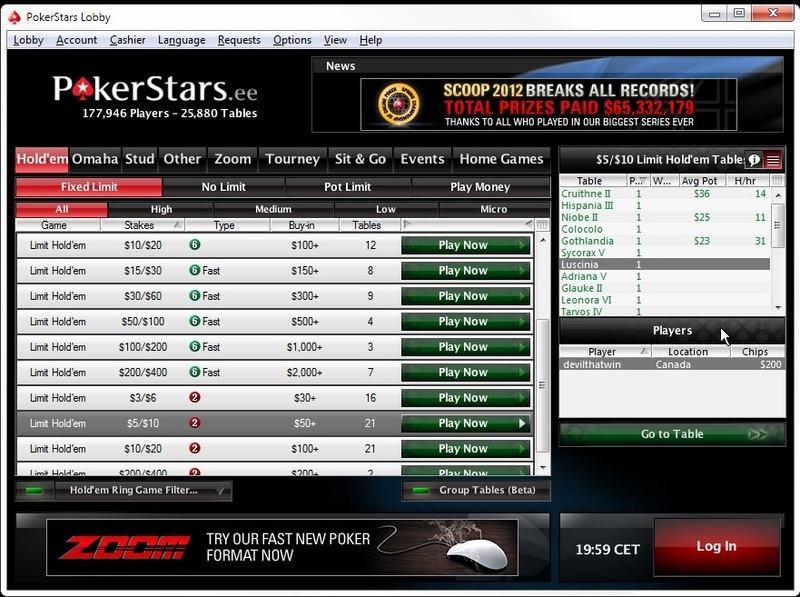 The PokerStars software is favored by poker pro online players who like to multi table, as seen in the video above. 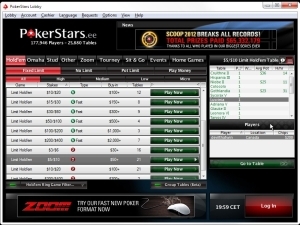 Pokerstars software is fast efficient and easy on the eyes. The sheer numbers of players ensures brisk action cash games and tournaments available all hours of the day or night.. If you've never played poker online, take a look at the PokerStars How To Step by Step Instructions. While Pokerstars is the undisputed king of online poker, it does attract higher level players from whom it is harder to win money. Also the popularity of the site makes it a magnet for those players who like to multitable which can drastically slow down the action at a table if they are too slow to respond to their turn. This issue can be avoided by joining a table with a fast action setting or playing the popular "Zoom Poker" variant where there is no waiting at all between hands. As soon as your hand is folded, BAM, you are transported to a new table all ready to go with a new hand. Online poker ON STEROIDS!!.. The real Rafa (Nadal) playing poker on PokerStars. Pokerstars recruits the biggest names in sports and poker for their "Team PokerStars" program to promote their brand. The dominant industry leader has the clout to recruit world superstars. Their poker software is world class, as is their management and overall business. PokerStars is a must have for any serious online poker player. 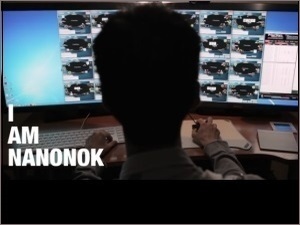 Enough video, let's play already..
Video of Nononoko, an experienced poker player doing multri table action on PokerStars. Poker is a fast action game but if you are playing a full table, when you fold, there is nothing to do but twiddle your thumbs till the next hand is dealt. Multi tabling takes care of that for you. You will have your hands full at all times. For experienced players only! !.